Get an professional online store build by experts web developers. Delight your visitors with a modern and professional online store. Sell online your products or services with a powerfull e-commerce website. 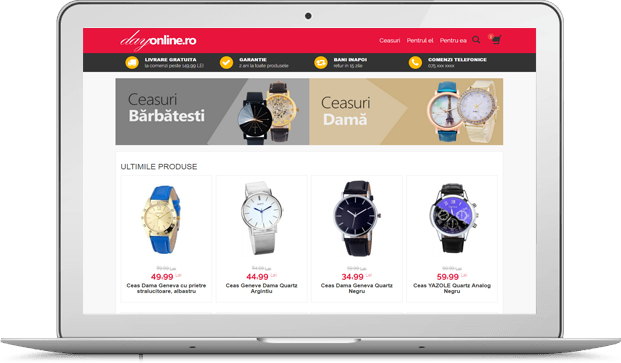 Own your shoppers with a unique design, a powerfull platform with hundred options and unlimited access to all features. We are working with most popular web applications like Magento, Prestahop, Opencart, Woocommerce, osCommerce, Shopify. Each website has an unique high quality design, user friendly, retina ready and responsive. We integrate any type of payment like Paypal, Credit Card, Wire Transfer, Skrill, Bitcoin etc. With the powerfull platforms we use, you can add unlimited products, categories, tags, filters, discounts etc.